Rain-slick streets beneath an alien sky. Untraceable mail on a private terminal. A man in a shabby coat who is always watching. Poison in a glistening needle. From the distant ages of humanity's dawn to the far end of the Silence, espionage changes only its tools. A useful lie is eternal. 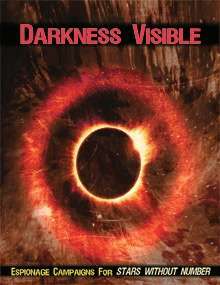 With this book, GMs and players are equipped with everything they need to run campaigns of interstellar intrigue and covert action. New backgrounds, training packages and equipment options will kit out your starfaring spies, and the history and context of interstellar espionage will help you plan your adventures in a cosmos in dire need of your help. GMs are given special help in assembling an espionage campaign, with tools for the cooperative creation of enigmatic intelligence agencies and long-hidden Perimeter outposts. You'll also find concrete, step-by-step techniques for building complex spy adventures and sinister plots, complete with detailed support material to keep your focus on the fun. How compatible is this with the new revised edition of the game? Apart from converting descending AC to ascending, condensing the more specific skills of the first edition into broader ones, and condensing the original five saving throws into three, it's basically the same system, so you shouldn't have any trouble using all the old supplements.